Give your I.Q. a boost when you wear this quick-knit tweedy vest on the first day of fall classes. You may not be the smartest cookie in the class, but your professor doesn’t have to know it- at least not until you turn in your first essay. No matter your marks, you can at least play the part of an eager-beaver learner in this scholarly vest. Worked from the hem up to the shoulders, this vest uses a stitch pattern and darts to shape the waist and the bust. 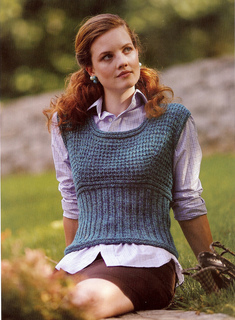 Ribbing ends just below the bust where a tweedy broken-rib stitch pattern begins. The front are worked separately and joined at the shoulders. Trim at armhole and neckline edges is picked up and knit after the garment is complete.